Rock the Bells wrote in to tell us that there will be a special preview screening of the movie named none other than... you guessed it... Rock the Bells! At the Alamo Drafthouse Downtown this Thursday Jan 4th, 11th, and 14th. The film follows a hip hop concert promoter as he tries to put together a concert with the complete original line-up of the Wu-Tang Clan! Check out the preview... pretty dope. 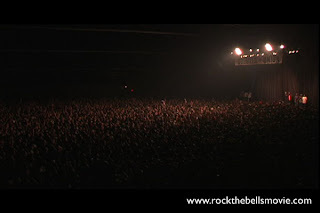 Furiously paced and rich with multiple narratives, "Rock the Bells" follows Weisberg and his guerilla promotion team as they fight for the arrival of all nine Wu-Tang members, battle broken equipment and overwhelmed security, attempt to control the riotous crowd in the overheated, over-crowded venue and deliver the history-making show they have promised. The film also features performances by Redman, Dilated Peoples, MC Supernatural, Sage Francis, Eyedea & Abilities, Chali 2na and DJ Numark.